The energy-geek world I inhabit has been abuzz this week with the announcement of commercial terms for the construction of 3.2 GW of new nuclear power in the UK, to be known as Hinkley Point C. Total cost to first operation is £16 billion, comprising £14 billion in construction and £2 billion in costs to date. At £5,000 kW installed, we are talking some serious coin here. To put that generation size in the Australian context, it’s about the same as the combined capacity of Loy Yang A and B. These dirt-burning brown-coal power stations provide 47% of Victoria’s electricity, and about 25 million tCO2-e per year. Hinkley Point C is a massive energy development. A wholesale price of £92.50/MWh has been agreed for the first 35 years of the life (correction from 30 years previously stated) (which will drop to £89.50 if a new reactor at Sizewell is built). This price includes mandated funding of future decommissioning and waste management. Should market prices rise above this, the operator will return the difference. Should prices fall below this, the operator will be topped-up. What has been achieved in the UK is worthy of praise. This deal provides certainty for both investors and consumers. Without certainty there will be no large capital investment in clean energy of any flavour. This reform structure should be of interest to anyone who wants to see clean energy of any kind enter private markets at appreciable scale. the Hinkley deal represents the first achievement of the Electricity Market Reform, designed to attract non-public investment into areas the market would not in itself invest in. Left to its own devices, the market is more likely to invest in gas power stations. Capital costs are low, and although the cost of the fuel is high and unstable, these costs can be passed on to consumers. Low carbon technologies like nuclear and renewables have the opposite character. They have high capital costs and low running costs. This is why the International Energy Agency said that EMR was essential to delivering a transition to low carbon energy. The UK market reform to appears to have succeeded in overcoming this barrier. The very fair question remains: is this a good or a bad price? As ever, comparison is the only sensible way to answer it. Compared to current wholesale prices in the UK, it looks awful. It’s nearly double, and close to the retail price. This comparison is relevant if such prices were expected to continue. They are not. Dirty coal provides about 40% of UK electricity at the currently much cheaper prices. This situation is coming to an end. So retrospective comparisons are of limited use. It is more informative to compare to the other options moving ahead. Hinkley is expected to be competitive with new combined cycle gas in the UK (government estimates ranging from £89-£111 MWh). That’s a big tick. The strike price is also lower than the Government-agreed strike prices for other clean energy options This is shown below (and discussed in further detail in a recent post from Mark Lynas). The above prices are a little soft on the clean energy competition, as they do not incorporate system costs like grid enhancement for effective management of intermittency or provision of backup. The Hinkley price has no impact in 2013, it will have an impact in the 2020s, right through to 2080! With a 60 year rated life, the UK is bringing on 3.2 GW of clean electricity price certainty for the first 35 years. That’s impressive. If one also considers the phenomenally large advantages of nuclear in terms of land use and resource consumption and the absence of air pollution, this is a clean energy project that deserves support. 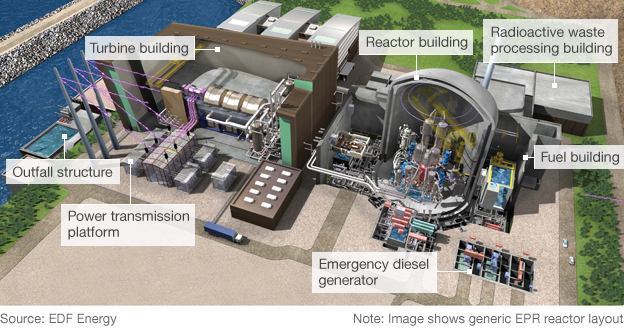 Commentator George Monbiot bemoaned that the UK has not instead moved to commission its first PRISM fast reactor that will operate using waste as fuel. I share his enthusiasm for the technology and his frustration at the recent silence. I also believe and hope that these two nuclear projects are far from in competition with each other in the UK. 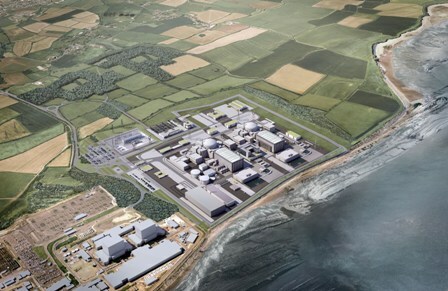 Hinkley Point C is 3.2 GW in size, equivalent to around 11 PRISM reactors. GE Hitachi currently wants to construct two of them in the UK, the first two commercial builds in the world. The only outcome of Nuclear vs Nuclear is a loss in the fight against climate change, and the environmental imperative for clean energy is far greater than that for near-zero waste. I argue that nuclear power represents great long term value when all the reliability and environmental benefits are considered against a relatively small premium compared to fossil fuels. Sadly, “great value” and “too expensive” are perfectly capable of co-existing. On that point Monbiot is also right that it’s still too damn expensive. We need to replace every coal plant in developed nations and displace every future coal plant in a fast growing developing world. This is not the type of price that will do it. Our newly-governing Liberal/National Coalition has a track record of comparatively greater nuclear support. It also has current leadership that has downgraded climate change to a national irritation for which the cure seems to be some sort of aggressive cultural and intellectual de-lousing. Our recently deposed Labor Party took huge political hits to put a price on carbon dioxide emissions, while maintaining opposition to nuclear power (I am very impressed and encouraged that senior Labor figures are putting this policy position forward for reconsideration under the new leadership). Our Australian Greens shout “climate emergency” (and I agree), only to take a deep breath and attack nuclear power as seemingly the only thing worse than climate change. So, take a political mess like that and prices at anything like £5,000 per kW and what have you got? Little chance for large scale clean energy, that’s what. Or, take developing markets where the imperative to supply lots of electricity right now far outweighs concerns about climate or pollution and what have you got? Construction of everything and anything, including a massive new fossil sector that our climate budget can ill-afford. What we need is for nuclear power especially, as the only sufficiently scalable solution, to reach a price point where it becomes the true no-brainer for replacing and displacing coal and then gas. It’s amazing how much a massive and undeniable price advantage can cut through political quagmire. High prices require equally high political consensus and the opposite is also true. Unless we get prices that drive a rapid expansion all on their own, we are likely to continue to see failures globally of the type Australia has seen since 1960: growth in clean energy, with bigger growth in fossil fuels. Furthermore, it seems nuclear opponents are increasingly dressing up their ideological bias in the economic case as their traditional arguments fail. Their economic arguments are unbalanced and with a clear agenda and they are not completely wrong! The recent US experience with a gas boom is the case in point of what needs to happen with clean energy. There, electricity production has moved strongly away from coal, and emissions have fallen to 1994 levels. It’s the right example, with the wrong fuel that falls well short of the outcome we all need. 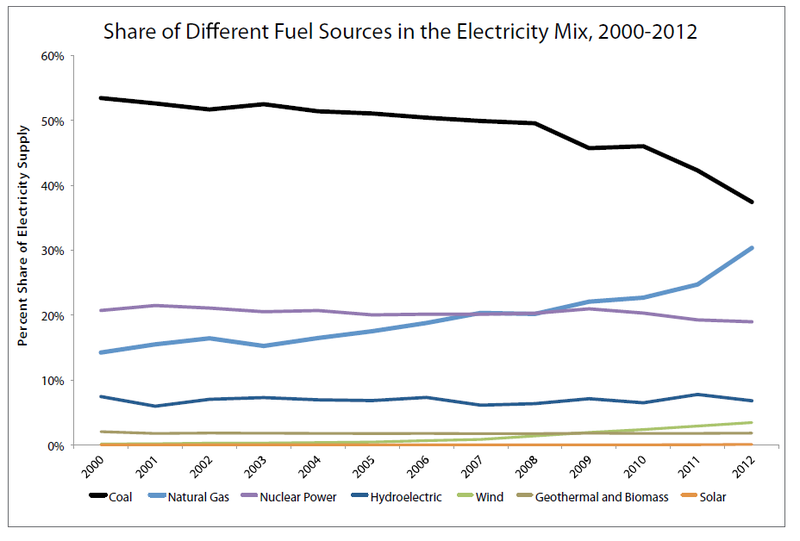 The two lines heading up in the US are wind and gas, with gas doing much more than wind. Money talks. 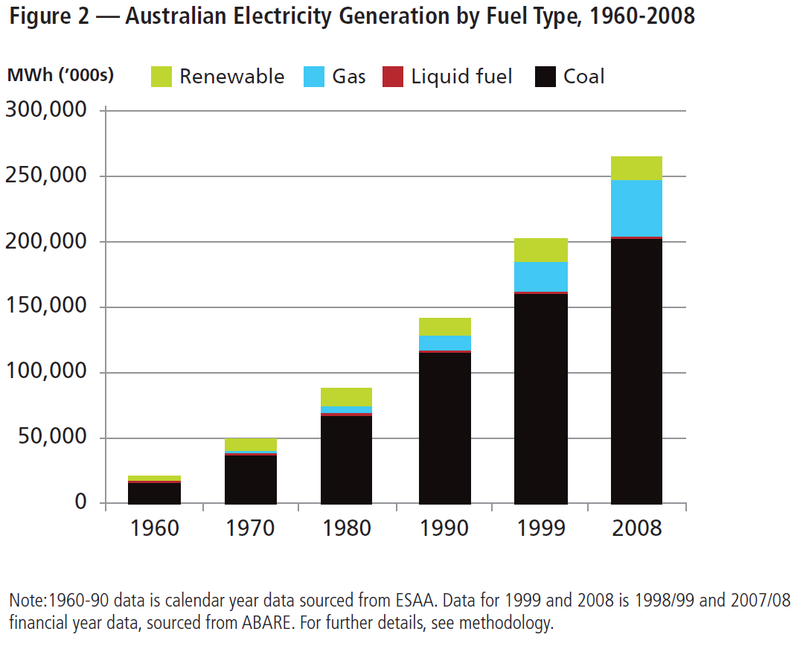 Image from The Breakthrough Institute Report “Coal Killer”. The lessons from the UK this week are hugely encouraging. With the right positioning of politics, electricity market reform for large scale clean energy is possible. What we need now is for nuclear industry players to speak to us and tell us how, over the coming years, they are going to deliver this product at lower and lower prices, to ease the political pressure and make commissioning great big gobs of clean energy the no-brainer it needs to be. Will this come through Generation III+ Small Modular Reactors (SMR), Integral Fast Reactors (IFR), Liquid Fuel Thorium Reactors (LFTR) or simply big learning gains through the new build currently taking place? (We are already seeing the latter in China and South Korea). Hopefully, lower prices will come from all these places and more. Nuclear power is clean. It’s safe. It’s efficient. It can make a big difference, fast. Waste can be managed until we use it as fuel and fear of radiation can be defused. It is, as I have said, great value. What advocates can’t do is make it cheaper than fossil fuels when it isn’t, in a world of weak consensus on climate change action and lacklustre energy planning. We need to keep working for that climate consensus, for sensible long-term policy to support massive clean energy and to overcome the ill-conceived objections to nuclear. At the same time we urgently need a stronger and more visible vision and plan for better nuclear prices and faster roll out, and it needs to come from the industry. At 2% discount $100 in 2050 some 37 years from now is less than $50 in today’s prices. It could be the bargain on the century. Many other things will happen in that time like petrol going the way of whale oil or Aussies winning the Test. I thought GE-Hitachi would front up the capex on the PRISMs and charge a fee. That is no taxes and presumably modest electricity prices. Ironically SA will sell lots of uranium to Hinkley’s fuel provider when perhaps the UK’s 120 tonnes of plutonium should be used first. Issue is getting PRISM approved as a reactor design. It might be easier to get PRISM approved initially in the UK rather than the US because of the better level of political support for nuclear power. They gave a commitment to front the capex and not charge if the reactor does not perform in the stated task of using the plutonium and generating electricity. At that point I believe they will want some money 🙂 and then charge for the power sold and the service of plutonium disposal/downgrading. This decision sends a really important message. Big cities aren’t going away and they need serious globs of clean electricity. The little land area graphic can’t capture the scales it mentions. For that you need a practised numerate imagination. Just think about the simple act of buying the access to the sites required for the daytime-only or windy-only un-equivalents. The planning logistics and nimby politics would make dealing with anti-nukes a walk in the park. In the near future I’d envisage a cluster of smaller reactors winning this kind of deal, but today this is a good decision. I agree. I want to see this get easier and easier. I’m impressed with this. The Areva EPR must be a good machine as customers don’t seem deterred by upfront cost and long build times. Perhaps they think/hope the French government will pick up any extra costs. However I think Australia should break the ice with an SMR cluster either to power a mining project and desal like Olympic Dam or a coal-to-nuclear project in the Latrobe or Hunter valleys. As soon as that runs glitch free for a few months start on a bigger installation. Another reason I think SA is a good place to start is the hi tech manufacturing knowledge in the car and defence industries, both headed for a quiet period. That’s on top of looming gas shortages, the need for summer power imports and the inability to develop resource projects. Some have argued that the EPR is too complex and too big and does not allow large cost reductions due to learning. SMR’s seem to have an advantage in that regard. Personally, I should think that 4th generation designs that incorporate true inherent safety (i.e. completely passive shutdown and release of decay heat, i.e. “walk-away safety”) would have far more cost-cutting potential in the long run that the EPR. I can imagine that the sunk-costs of the EPR development will mean that there will be quite some ‘nuclear vs. nuclear’ resistance to quickly tapping the potential of SMR and/or 4th gen systems, unfortunately. That is unfortunate because nuclear electricity cost has to fall well below half of the strike price of the Hinkley project, if large penetration of nuclear on the global scale is to be realized. While I can imagine EPR reaching such a cost some time in the future, after a number have been built, I don’t see it happening quickly enough to matter much in regard to solving global climate disruption. Perhaps the Chinese will be able to build EPR’s more cheaply than the French? We will find out soon, as they are almost finished with their’s. As far as I have understood, nuclear electricity could potentially cost as little as 2 ct/kWh, about five times cheaper than the Hinkley EPR’s. The question now is how to reach that, quickly? I’m pretty sure it could be done, but probably not with EPR type approach I think, and certainly not without the kind of political (and public) support that has been lacking for the past thirty years. One exotic option I have been thinking about more and more is to make nuclear power generation a task for the military. We know that current navy (ship-born) power plants (which are only a few hundred MW at most) are extremely inexpensive. They already reach the 2 ct/kWh price-point today (excluding the cost of putting them on a ship). Put the military in charge of building land-based nuclear power generators according to their own designs, processes and protocols (which are highly rational and safe, and which incorporate inherent safety and rapid ramping/load following capabilities! ), and I think we would see a nuclear revival of a scale and efficiency that would blast civilian fossil based electricity generation completely out of the water. For what it’s worth, I have discussed this option with friends of mine who are soldiers and they love the idea! We do NOT want the ADF going anywhere near nuclear power procurement, unless it is to buy some off-the-shelf Virginia class subs that are fully serviced by the USN. I’m not so sure it is such a good deal. After all, the investment is £14bn and the price of electricity is £90/MWh. That it is cheaper than wind in the UK is not that encouraging. Even if the UK prices are outrageously high (in France, wind has a FiT at €82/MWh), such a high price does not bode well for the future of low carbon energy. The price you give for electricity from gas no doubt includes a carbon tax. The carbon floor will act just like that in the UK, not so much elsewhere. So fossil fuels are still way cheaper than everything else, save hydro maybe. And that matters a lot. I also want to stress that it would be the 5th and 6th EPRs. Unless EDF expects lots of legal wrangling and problems with UK’s nuclear regulator, the price tag means the EPR may remain ultra-expensive, far from the €60/MWh that Areva & EDF say they can do in France. Or it will turn out to be a lucrative investment. Thanks for another great piece Ben. John Newlands is right to suggest a bank of SMR’s at Olympic Dam. That has been part of my plan for SA development now for ten years. And it features in one of my four Ockham’s Razor talks on ABC Radio National.I’ve put all four together in one speech a copy of which I have now sent to new BHP CEO Andrew MacKenzie,to Chris Richardson of Deloitte Access Economics, to Martin Thomas of ATSE,to members of the SA select committee looking into replacement of Port Augusta coal with solar thermal[ not a very good idea]to Martin Ferguson [sadly he’s sensibly gone on to better things, so he tells me]. I shall send a copy to Bill Shorten tomorrow and tell him to expedite further ALP discussion on the issue and I’ll ask him why it is that in addition to Hinckley there are 17 other countries building nuclear reactors right now adding to the 32 countries still generating nuclear. Ben, would you like to put up my fourth Ockham’s Razor talk for your followers to consider? Let me know! Cheers Ben and keep up your good work. Terry I think the SMRs should be in the Ceduna-Streaky Bay area and combined with the ill fated Whyalla desal. I know Roxby Downs (= Olympic Dam) once had a diesel power station presumably with an automotive style radiator cooling system then a 132kv line was built from Pt Augusta. The OD expansion plan called for an air cooled 250 MW gas fired power station onsite with another 400 MW drawn from the NEM. Whyalla was a bad choice for the desal plant with the cuttlefish breeding ground and poor dispersal of brine so high up in the gulf. The Whyalla-Roxby Downs fresh water pipe was to be 324 km if I recall but .Ceduna-OD is only about 350 km. Open ocean frontage also means SMRs could get more efficient seawater cooling. The desal could a hybrid of flash distillation and reverse osmosis to take advantage of co-location. Strangely Woomera just 70 km from OD gets water pumped around 400 km from the River Murray. Woomera is supposed to be a hot spot for testing military drones, all hush hush. That whole area could go ahead with aquaculture on the coast and new mines inland for gold, silver, uranium and iron ore An SMR park on the west coast means more river water, service jobs and energy security for Adelaide. Deep greens need not fret as it will be far away. My suggestion for a bank of SMR’s at OD was just part of my vision for development in SA over the next 25-30 years. I’ve been putting the vision out now since 2000. Let me have your postal address and I’ll send you a hard copy of the vision statement and other writings which may interest you.The vision statement featured in the September edition of the Adelaide Review 2009, if you can lay hands on a copy. Appreciated. I think I have an old email address for you and I’ve sent you my snail mail address. I’d make the general point that SA tends to be Adelaide-centric when the untapped resources are in the west and the north of the state. That includes 25% of the world’s easily mined uranium yet the opportunity goes begging because some unwritten rule says it has to be powered by fossil fuel or unreliable energy, otherwise it won’t happen. Wrong. It’s 35 years, index linked for the first nuke. The second one gets the slightly lower price – assuming either of them actually get built, which is far from certain. It doesn’t bode well for the rest of this blog post if you cannot get these very basic facts correct. So, they needed double the wholesale price of electricity, index linked for a third of a century, a £10 billion loan guarantee, and handing over access to the UK grid to the Chinese. It looks like a disastrous deal to anyone not blinded by pro-nuke ideology or vested interest. But to make things even worse, by the time this proposed new nuke might come online in 10 to 20 years, it will have done precisely nothing to abate the UK’s CO2 emissions because most of the UK nuke fleet will be past end of life by then. What we have with this deal is nothing but maintaining the nuke-fossil status quo and continuing destabilisation of the climate. ” It’s 35 years,”. You are right. I mis-read the information. I will amend. Indexation applies to all strike prices for all technology, so is not relevant for the arguments in this piece. Nor is xenophobia regarding foreign investment. Your comment construes 3.2 GW of clean power for 60 years as a bad thing, criticising nuclear then lamenting that upcoming closures may drive up greenhouse emissions. These are strange remarks. I’m not moved by suggestions of ideology on my part. In early 2014, the cost of solar electricity in Germany is already lower than that of nuclear power in the EPR project in Britain, of which the commissioning would take place in 2023 (except usual delay). The cost of electricity produced in 2017 by the French EPR reactor will be 107 € / MWh. In France, the cost of electricity production by the EPR nuclear reactor (2017) will be much higher than the current cost (feed-in tariff) of onshore wind power and than of medium and large solar photovoltaic installations. At 1.19 € /£, that would be 89.9 £/MWh; the cross-channel EPR energy prices are comparable. Wind and solar energy certainly is a good deal if you can get it — and if you can use it when you do. There are several related issues. Firstly, wind and solar by themselves cannot keep the lights on. They are unreliable, and best thought as a way to reduce fuel consumption at the fossil plants that must still be maintained at ready standby to provide reliable energy. The feed-in-tariffs afforded wind and solar do not reflect this (not particularly well) hidden cost. Secondly, when one looks at the price of intermittent energy today or in the near future, one is looking at its marginal price at low-market penetration. This is shortsighted. The U.K. grid operator (DECC) is required by statute to take a longer view, and ascertain how to achieve low-cost reliable power in 2050 at no more than 50 g CO2/kWh. To do that entirely on wind, solar, hydro, and fossils will require substantial overbuild — 3 or 4 fold — which will be costly indeed. On another thread someone posted a link to The Challenges of Intermittency in North West European Power Markets, which is well worth a read. Another brief article is a New critique of AEMO 100% renewable electricity for Australia report, in which Prof Trainer suggests these all-renewables-all-of-the-time thingies aren’t quite as simple as they appear, and likely considerably more expensive. The SBS doco Acid Ocean looked at the effect of decreasing ocean pH from 8.2 to 7.9 due to CO2 overload. The concluding shots were not of corals but wind turbines, solar panels or both. The final commentary was a question to the effect ‘we have the solution, what’s stopping us?’. I suggest the answer is that those things are only part of the solution.